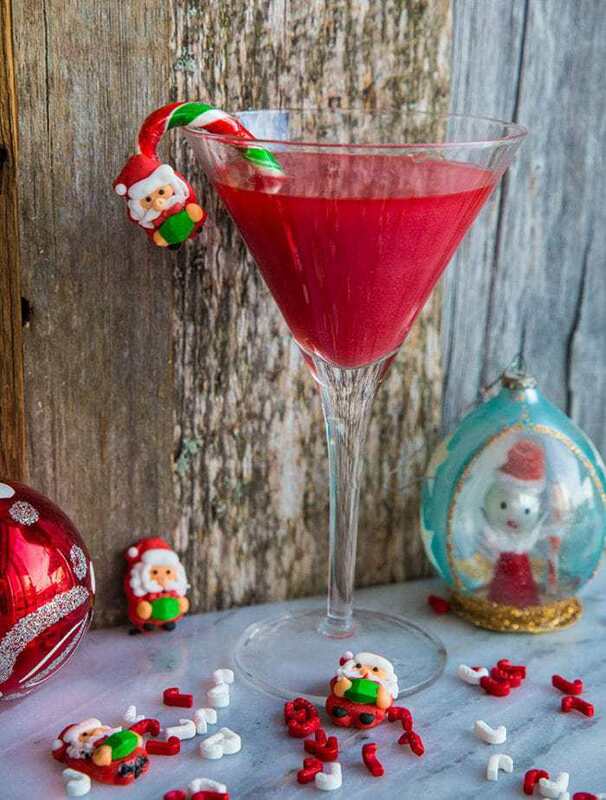 The Shimmery Santa Baby cocktail is pretty and delicious! I have had this cocktail on my mind ever since the purple shimmery liquor made it’s appearance at my 40th birthday party. 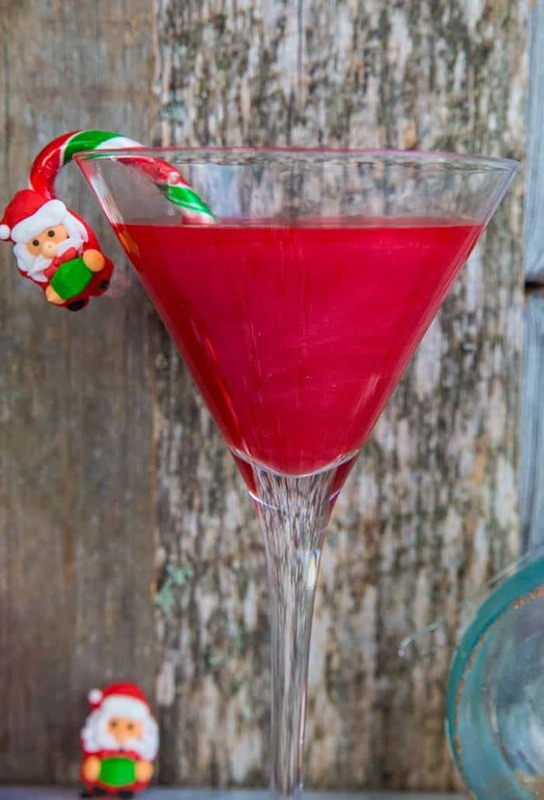 Actually, I didn’t have this specific Shimmery Santa Baby Cocktail on my mind, but I liked the concept of sparkly liquor. I mean, come on, my nickname IS Magpie, right? However that purple stuff did NOT taste good. It might be ok if you mix it into a drink, but I haven’t worked on that yet. No one at my 40th party liked it- but you know, we had had a jug of French 75’s by that point…soooo maybe our judgement wasn’t to be trusted. This tastes like strawberries – and to be honest you could use any red liquor from cinnamon to raspberry, the choice is up to you. What makes the drink shimmery is Cake Luster Dust! It is completely tasteless and edible, it’s used on cakes all the time and it rocks. I used red to boost the color of the drink and then gold for the shimmery effect as it showed up the best- but just wait, I have another shimmery, sparkly cocktail coming soon as well and that one uses silver! As for the Santa’s (because I know you are all going to ask!) they are simply sugar decorations. I peeled the bottom of the candy cane from the wrapper, left the top on so I could touch it germ free (important!) and stuck Santa on there. Just use your favourite Royal Icing (the one that hardens up like cement!) and stick the Santa’s on. This is a no-brainer, you guys. Put that sparkle stuff in everything! So, who is up for a shimmery cocktail this Christmas? I think I’ll be making a few or more! What's red, sparkly & tastes like strawberries? My new Shimmery Santa Baby Cocktail! 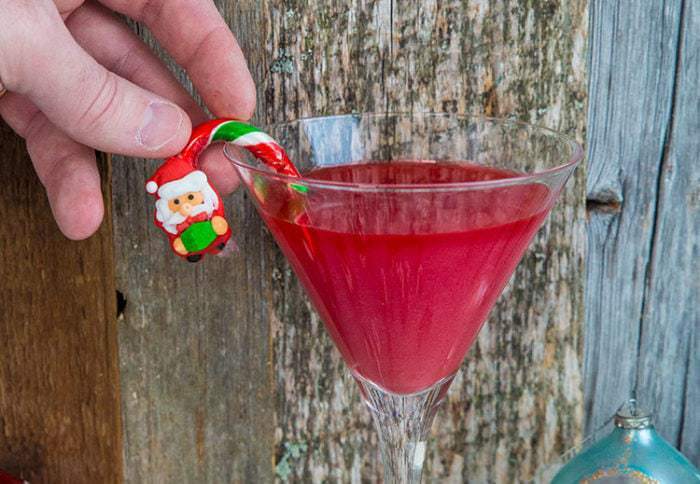 This is THE cocktail for Christmas! Combine all ingredients into a cocktail shaker filled with ice. Shake until the shaker is cold to the touch. Pour into a martini glass and serve!